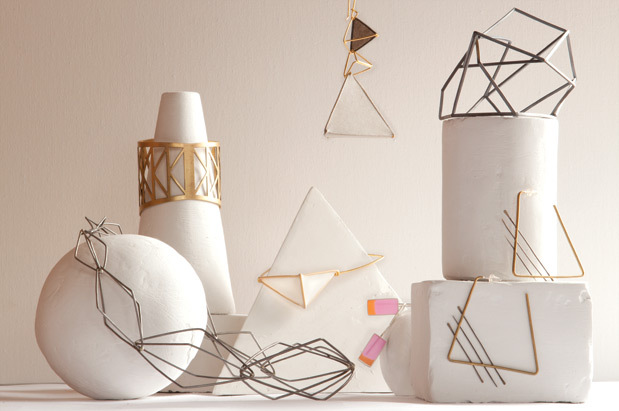 Northwest jewelry artists are doing the math, creating modern style with shapes and angles. Top row, left to right: “Fremont Bridge” brass-etched and oxidized cuff with triangle design, by Portland-based Betsy & Iya ($72, available at Retail Therapy on Capitol Hill or betsyandiya.myshopify.com). “Exquisite Palpitation” earrings in 18k gold vermeil with detachable sections (can be worn with one or all three triangular pieces), by Tia Kramer of Northlake-based Tia Kramer Paper Jewelry ($495, line available at Bellevue Arts Museum store or tiakramerjewelry.com). “Runway Cuff No. 2” silver metal cuff with abstract geometrical design, by Sarah Loertscher of West Seattle-based Sarah Loertscher Design ($440, line available at Click! Design That Fits in West Seattle or sarahloertscher.com). Bottom row, left to right: “Paragon” steel wire and beeswax necklace with interlocking rhombus pieces, by Kimber Leblicq of Beacon Hill-based Kimber Elements ($245, available at Fancy in Belltown or kimber-elements.com). “Exquisite Eaves” pyramid bangle in 18k gold vermeil with translucent white paper pendant accent, also by Tia Kramer ($250, availability details listed above). “Fix You” fuchsia and orange hand-colored resin rectangle earrings in sterling silver, by Jennifer Graves of Woodinville-based Lolly Jo Lolli ($48, available at lollyjololli.etsy.com). “Corollary Triangle” hand-formed and -pounded brass trapezoid earrings with diagonal hammered bronze accents, also by Betsy & Iya ($64, availability details listed above).